With a Rakhi on your wrist give a wrist watch to your sister to accessorise her wrist with this Rakshabandhan. Select from a range of SEIKO ladies watch collection and give your sister a gift for lifetime. These elegant timepieces are about minimalistic design, high precision and performance. As time is the most treasured possession between you and her, make timekeeping now an aesthetic pleasure with Seiko’s new ladies watch. 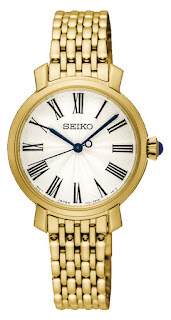 Attached with the mail are the four new models of SEIKO watches.